OLED TV deal: Save £1500 on 77in LG 4K OLED TV this weekend | What Hi-Fi? Want an OLED? How about a super-sized OLED? A super-sized OLED whose smaller sibling is a Product of the Year TV? If you're still nodding your heads at this point, we've got the TV deal for you. Currys and Sevenoaks are now offering a fantastic price on the 77in LG OLED77C8LLA 4K HDR OLED TV, which can now be picked up for £4999; that's £3000 less than its original price. You just need to enter the discount code, as below. OK, so it isn't exactly what most would call affordable, but considering it is among the best big-screen TVs currently on the market, and has been discounted by 37 per cent over its original price, we'd call it a cracker of a deal. It's the larger, 77in version of our favourite TV of 2018, the LG OLED55C8PLA, which we praised for its fantastically natural, punchy and class-leading picture quality, amazing upscaling, loads of apps and a stylish design. 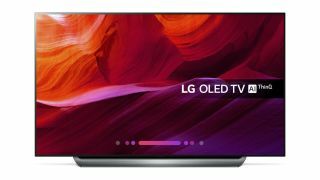 It features LG's Alpha 9 Intelligent Processor (only bettered by its forthcoming 2019 OLED TVs), ThinQ AI, webOS smart platform, Google Assistant voice control, HDR compatibility (HDR10, HLG, Dolby Vision and Advanced HDR by Technicolor), High Frame Rate support (120fps), Dolby Atmos and a streamlined Alpine stand.